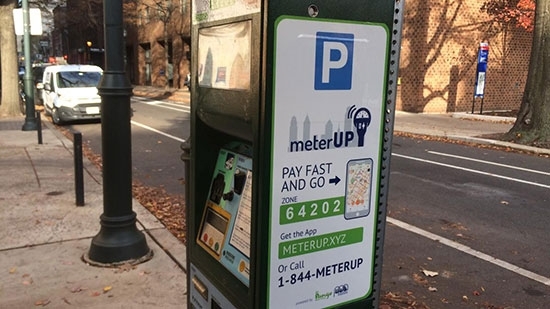 The Philadelphia Parking Authority is suspending parking meter payments through the mobile payment app, meterUp powered by Pango, tonight at 12:01 a.m. Wednesday, April 12. Parking Authority Deputy director Corrinne O'Connor blames the suspension on the financial problems of the service provider Pango USA. Some 40,000 motorists have been using the app to pay for street parking through the phone which also allows you to add time remotely without going back to the meter. Pango closed its Philadelphia offices 2 weeks ago. The company was having revenue problems and couldn't pay its costs. Pango was selected to provide services for the meterUp program in November 2015. Their $.01 transaction fee was significantly lower than the $.23 other companies bidding for the job proposed. Pango was going to sell advertising on the app to offset its costs and share 20% with the city, but it was unable to do so. The PPA will release a new Request for Proposals (RFA) this week to start the process on finding a new provider. In the meantime, all drivers will have to pay by cash, coin, or credit cards at parking kiosks. A former Montgomery County lawyer has been charged with dozens of counts alleging he stole nearly $147,000 from clients with special needs. 45-year-old Patrick Bradley is accused of stealing $116,340 from trust accounts he set up for five clients with special needs. He is also accused of stealing $30,577 from seven more clients who paid him to perform legal work which he never delivered. The Pennsylvania Office of Disciplinary Counsel suspended his license in August 2015, but Bradley continued to practice law for another year before he was disbarred last September. He faces nearly two dozen felony charges. Bradley is free on $250,000 unsecured bail. A preliminary hearing is May 5th. Jury selection for Bill Cosby's criminal sexual assault case will begin on May 22nd in Pittsburgh. Jurors for the case are being selected from Allegheny County. The defense had successfully argued that the case has received significant publicity here in the Philadelphia area and it would be impossible to find unbiased jurors in Montgomery County. They still believe the task will be difficult, and the judge plans to summon a large pool of potential jurors for questioning. Twelve jurors and six alternates will be sequestered 300 miles away from home near Norristown for the expected 2-week duration of the trial.